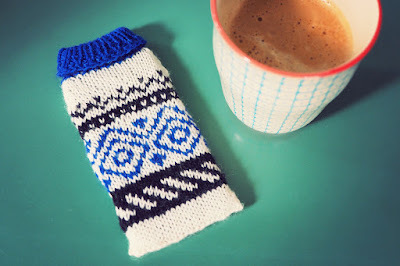 I knit this little iPhone cover for a friend of mine. It only took me a couple of hours, it's such a small project. I am not even sure if she'll use it, but I just felt like knitting something else, because I've felt a little stuck with my Silversmith Hoodie these last few days. This cosy was done with left over yarn from Antonia's Tardis Socks and it was heavily influenced by all the beautiful Norwegian Fair Isle patterns we saw while in Bergen. 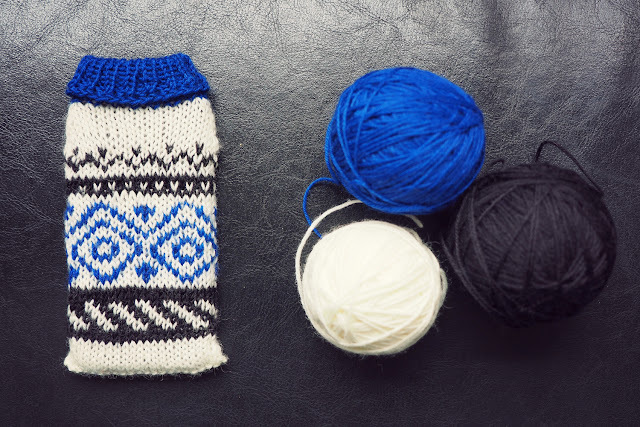 I always find it hard to knit fair isle on such a small scale, somehow the floats get more uneven than on bigger projects. But the blocking helped and now I think it looks neat. As written above my bigger project right now is my SSKAL16 project, the Silversmith Hoodie. 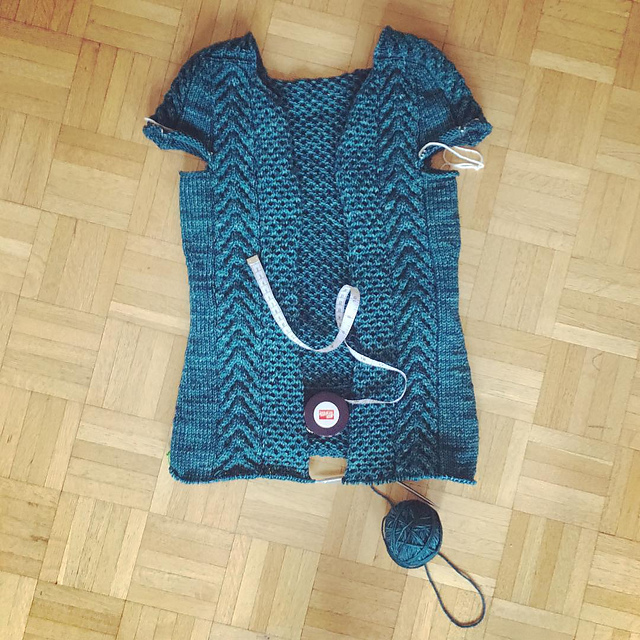 I started it on the 5th of August and have been knitting ever since. The pattern is fairly complicated because there is a big part that's made of small cables which slow me down considerably. I don't find it as hard as in the beginning but the going is still rather slow. I actually reached the desired lenght of the pattern (40 cm from the underarm) but I want this longer, almost like a coat, so I've been adding more length. I am almost where I want it to be, I think I need about 4 cm more and then I can start with the ribbing. I am in love with the colour and the pattern but it does get a bit repetitive, so I'll be glad to start on the sleeves. School will start again tomorrow, so I won't have as much time to knit anymore, but on the other hand the temperatures are cooling down and I spend more time on my sofa again, so I will still find enough time to knit. I am in a weird mood right now, but it might just be the end of summer blues, because now my five weeks of holidays are over. That cardigan will be worth it! It's gorgeous and the colour is perfect for you. I, too, am going back to teaching soon...I know what you mean about a weird mood. : ) Good luck with your school year. I almost can't remember what it feels like in front of a class. And by to,orrow noon it will feel as I'd never not done it hopefully. Have a good start too. 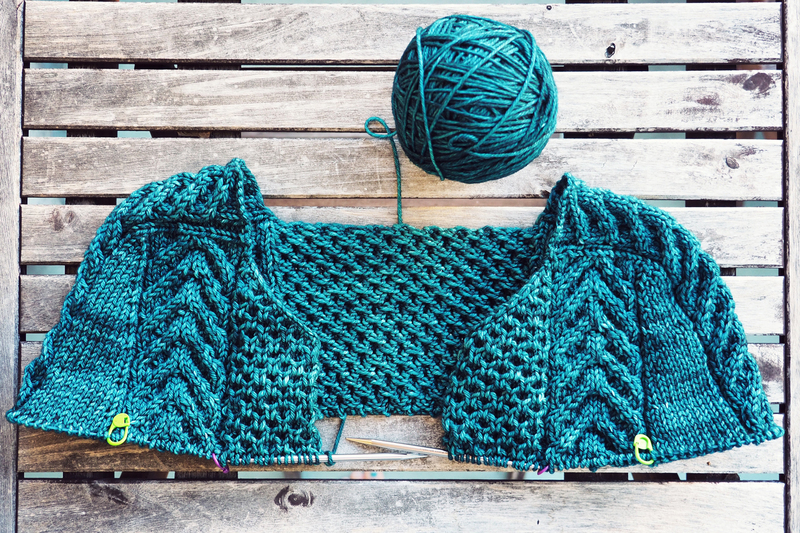 That cardigan is going to be gorgeous. 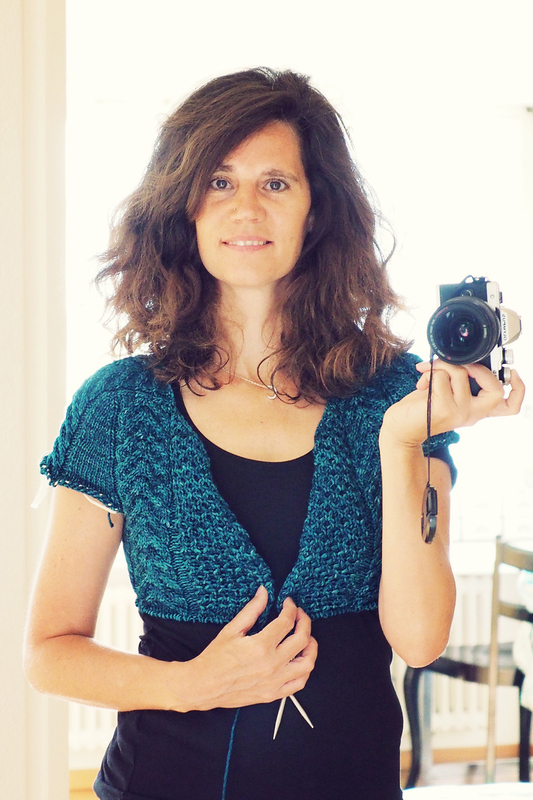 As usual your knits are amazing and this cardigan will be perfect on you. I get the weird feelings. Sending you love and positive thoughts. xo! Thank you Andi. I think I'll have more time at school to knit because my kids will eat out every day apart from Wednesdays, sothere might be more small projects like socks on the horizon. Mine is probably going to be quite warm as well, but I hope I'll be able to wear ot inside anyways. Your cardigan looks amazing! The color is so deep and rich and I adore this texture! It will be such a beauty when it's done! I finally bound off at the end of the body and could start with my first sleeve. Due to the high temperatures at the moment progress is super slow but it should cool down soon.